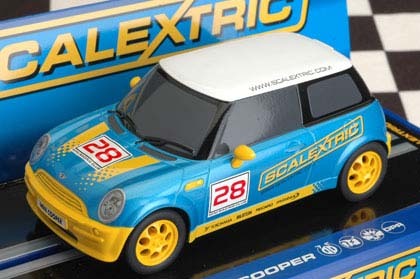 Scalextric came from the Scalex brand of Minimodels Ltd, which was a clockwork powered race car system that first appeared in 1952. Their inventor, B. “Freddie” Francis, showed Scalextric (“Scalex” plus “electric”) cars at the annual Harrogate Toy Fair in 1957 in the UK. In 1958, unable to meet demand for their popular range, the parent company was sold to Lines Bros Ltd, who operated as “Tri-ang”. Their subsidiary Rovex, which specialised in plastic, then developed Scalextric, converting the metal cars to the easier and cheaper to mould plastic. The track, which was originally a rubber compound, became moulded plastic at a later date. Production continued at Mini-models in Havant until 1967, when it moved to Rovex’s own site. When Lines Bros collapsed, their subsidiary Rovex-Triang, which handled Scalextric and the Triang railway brand, was sold off, eventually becoming Hornby Railways. Although Scalextric remained based in the UK, most of the products are made in China. Results were hit in 2007 by the closure of the Scalextric Race World retail store in Tacoma; Scalextric-USA created a store front in Auburn, Washington showcasing Scalextric slot cars, tracks and accessories.